The world is an unfair, unequal, insecure and unhealthy place for about half its population. Around 30% of ‘us’ have no access to adequate healthcare when needed, and 40% face a complete or near-complete loss of income security when a personal or a national economic crisis strikes. At least a third of the global population live in abject poverty (under US$3.10 per day) – i.e., the cruellest form of insecurity. Every second child is poor and 5-10 million children die every year of preventable causes; millions of elderly die too early for the same reason. Inequality is rising in many parts of the world, but in theory we have a governance mechanism to help tackle this sad state of affairs: the effective and efficient introduction of a comprehensive national social protection system. In the widest sense, social protection should go beyond the transfer of cash between and within different groups of a population. As defined in ILO Recommendation R. 202 on National Floors of Social Protection it should ensure access to all essential goods and services to all residents. Clearly, social protection systems will not work if they only focus on cash transfers. If essential goods and services cannot be accessed or bought, then cash and entitlements to health services provide very little de facto protection. So to ensure a minimum level of income security, social protection against poverty and inequality must include cash transfers and transfers-in-kind. Access must also be guaranteed for healthcare, education and essential services like water and sanitation. For a long time, many developing countries considered such systems beyond their fiscal reach. Juan Somavia, ILO’s former Director General, countered with a simple truth: “The world does not lack the resources to abolish poverty; it lacks the political will”. A sufficient level of national and international solidarity could mobilise the necessary resources to abolish abject, absolute poverty; but do we have the will at least to try? There is, in short, new hope. Although political will is fickle, the global community of nations has spelled out its intention to abolish poverty in “all its forms, everywhere”. In September 2015, a UN summit adopted 17 Sustainable Development Goals (SDGs) with 169 targets to be achieved by 2030. The new goals can be roughly divided into social, economic, environmental and rights-oriented goals, comprising inter alia a complete social protection agenda. Of the 17 SDGs, 11 have links to the social protection systems defined above; 28 of the targets for these 11 goals likewise link to social protection. In other words, implementing comprehensive national social protection schemes for all would achieve 28 of the 169 targets and ensure access to essential goods and services for all. How can these goals and targets be achieved by 2030? This question concerns governments, civil society, UN agencies and Bretton Woods institutions – and by extension all schools of governance. Therefore, in a series of research seminars from 2014-2016, MGSoG aimed to respond to this central question. The first two seminars (in 2014 and 2015) sought to establish whether the previous global development goals (i.e., the MDGs) were an effective instrument for global social governance. Along with parallel research by A.F. Bongestabs (1), the two seminars found that while the MDGs embodied a step forward in global social governance, there was little evidence of real change in peoples’ lives or government policies (i.e., concrete increased budget allocation to social services and protection). The results show that resource requirements would be 3-12% of GDP for the sample countries – a range confirmed by another pilot study for the Asian Development Bank (2). Complying with the SDGs by 2030 will thus have inevitable budgetary consequences for all developing countries. Put simply, long-term national financial and fiscal planning will have to account for these new obligations if the goals are to be seriously pursued. Not all resources will need to be mobilised through additional taxes, though; existing government revenues could be reallocated. But in several countries a large share of additional resources will have to be mobilised through increased “tax efforts”. The UN Economic and Social Commission for Asia and the Pacific (UNESCAP) says, “in many countries tax collection is below potential. In some countries, the gap between actual revenues collected and the level that would be appropriate given the economy’s structure is equivalent to 5% of GDP or more.” Clearly, countries need more than decent fiscal strategies; they also need time. Right now, a year after the adoption of the SDGs, it seems that national (and international) resource mobilisation and budgetary planning will not start early enough. By sounding this alarm, we hope that our research will be continued by government agencies and other schools of governance, and we hope to have made a contribution to the international development policy debate on how best to implement the SDGs. Let me now end this research and series on a lighter note with an age-old quote by farmers of the Dutch and German lowlands – farmers who would tell their priests when they prayed for a good harvest: “Praying is good, but it also needs manure”. 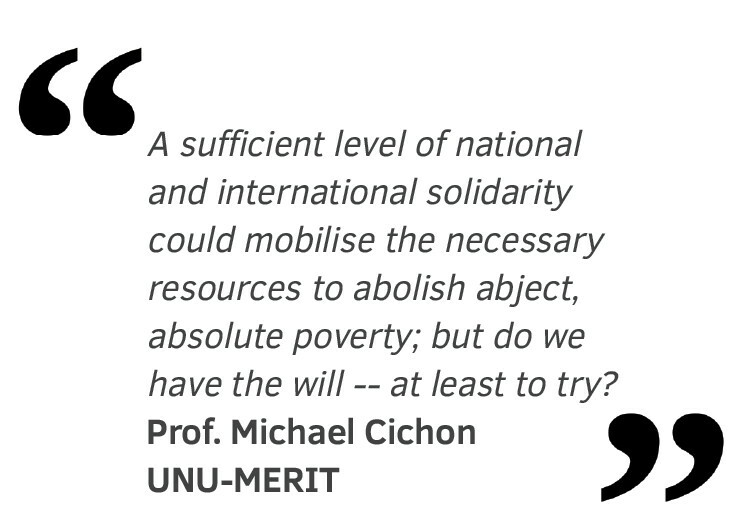 Michael Cichon became Honorary Professor in Social Protection at UNU-MERIT / School of Governance in July 2013. 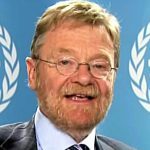 He previously worked for the International Labour Organization, where he was named Director of the Social Security Department in May 2005. He holds a PhD in Economics from the University of Göttingen in Germany.